Ormiston Gorge - with Spinifex and Ghost Gum. 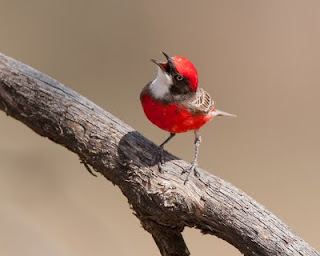 The following trip report covers a May 2007 birding trip to Alice Springs. We visited several of the better known sites (plus a few new ones) in the McDonell Ranges, and made trips to the beginning of the Tanami Track and the western edge of the Simpson Desert. Recent good rain (a couple of weeks prior) had transformed the normally arid, parched landscape into a thriving environment, with vigorous growth of seeding grasses and shrubs and the flowering of many local species of grevillea, acacia and eremophila. Budgerigars were abundant at all locations in the McDonnell's - small flocks of these birds wheeled around us at most locations, their distinctive chattering and screeches constantly filling the air. There were also large numbers of Crimson Chat. The weather was fine, sunny and pleasantly hot, possibly even slightly warmer than usual for April (an average of 33 degrees). The best birding was from first light through to about 10 am, then later in the day (4:30pm - dusk). 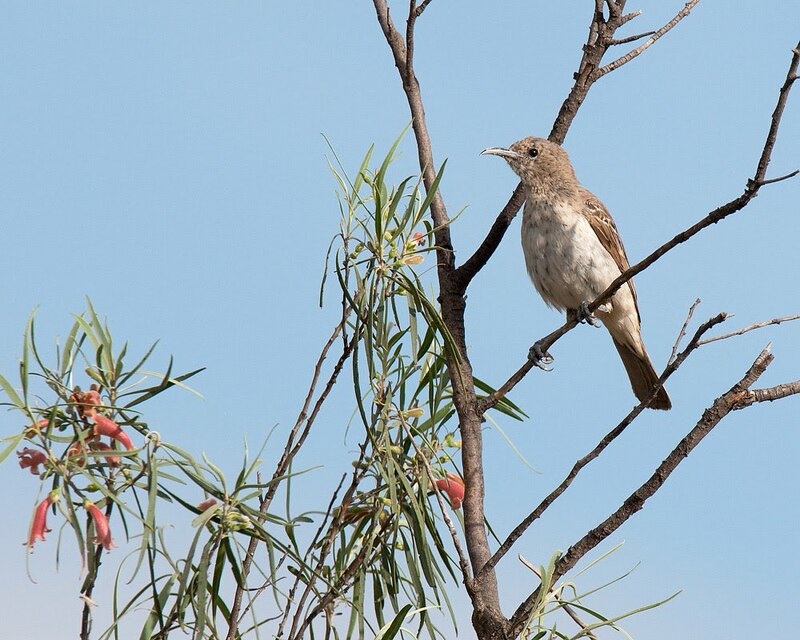 We managed to locate mos of our target species with the exception of the nomadic and rare Grey Honeyeater, absent throughout the area despite spasmodic flowering of its favored Mulga food-source Acacia aneura. 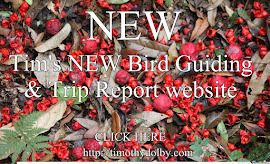 A well-known site for Rufous-crowned Emu-wren, Spinifexbird and Dusky Grasswren. Unfortunately Ellery Creek's Dolomite walk had suffered a recent fire, and there wasn't much mature Spinifex and thus few birds. Grey-headed Honeyeater were reasonably common. Crimson Chat - numbers fluctuate from season to season. 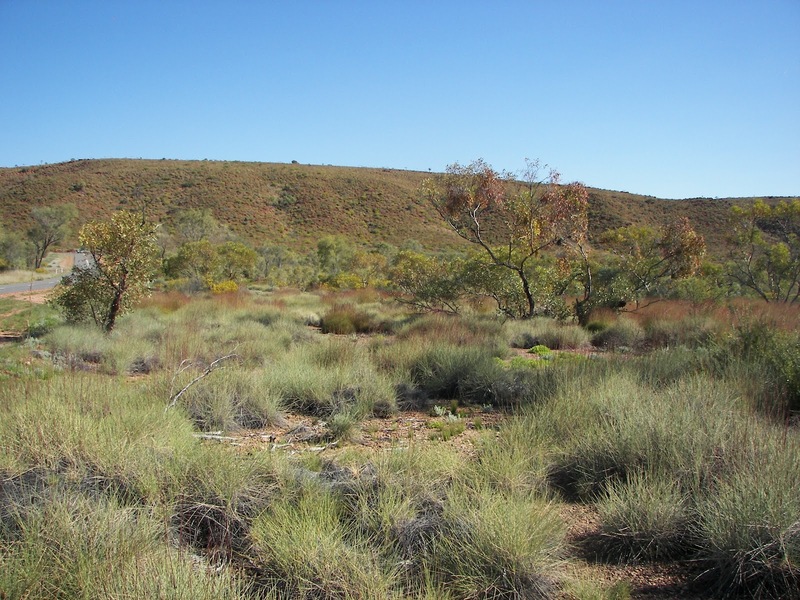 The first site we visit was a section of mature spinifex immediately after (50 m) the turn-off into Ormiston Gorge from Namatjira Drive to Ormiston Gorge Access Rd. On the west side of the road there is a large patch of Spinifex. With a bit of careful searching we found Spinifexbird and Rufous-crowned Emu-wren. Keep an eye on the sky for Little Woodswallow and White-backed Swallow overhead. Here we also saw a pair of Black-breasted Buzzard and Wedge-tailed Eagle; the latter a common sight along the roadsides, where they feed on carrion. The Pound Walk (7.5 km return) is a must. Spectacular scenery as you walk anti-clockwise through the pound and back through the gorge. We picked up Dusky Grasswren twice - firstly about 2.5 km into the walk (in the valley before you reach the saddle) and at the rocky outcrop in the centre of the pound itself. This outcrop was the only site on the entire trip where we recorded several Spinifex Pigeon (ssp leucogaster). Little Button-quail, Western Bowerbird, Black-chinned Honeyeater ('Golden-backed' ssp laetior) and Black-breasted Buzzard were other notables. There was also several Black-flanked Rock Wallaby in the gorge near the main rock pool. Budgerigars were abundant here, especially in the Gorge area. As we walked through the gorge, small flocks flew up and back at break-neck speed, attempting to avoid a pair of Peregrine Falcon. The falcons would sit up high on the cliff-face waiting for the approaching budgies, then dive down into the gorge to attempt a kill (one was successful). There are several good birdwatching walks in the area. The Ghost Gum Walk(15 minutes return, 200 m),located near the information centre is an excellent short walk, while the longer Cassia Hill Walk (1. 5 km, 1 hour return) can also be very productive. On both walks was saw a range of nectar feeding species such as Grey-headed, Brown, Spiny-cheeked and Singing Honeyeater. All of these species are locally nomadic, with a preference for River Red and Ghost Gum found along the gorges and watercourses. Dusky Grasswren occur in the rock scree and spinifex covered slopes on the left as you approach Simpson’s Gap, and we also saw Budgerigar and Major Mitchell's Cockatoo. A few Little Woodswallow circled the ridges. Other bush birds here including Chestnut-rumped and Inland Thornbill, Western Gerygone, Pied Butcherbird, Western Bowerbird and Collared Sparrowhawk. Simpson’s Gap is also one of the more reliable sites for Black-footed Rock Wallaby, look for them along the short walking track into the Gap and amongst the large boulder field on the east side of the gorge entrance. As far as variety and abundance of birds, this was the most active and vibrant area on the entire trip. Many plants and eucalypts were in flower and the recent rain had triggered thick grass growth. Budgerigar were abundant, even nesting in the tree above our campsite! We finally had a small flock of Painted Finch fly over, plus a single bird on the Gorge Walk. On the drive out on the roadside, the bush was alive with Crimson Chat, Diamond Dove, Black-faced Woodswallow (ssp melanops), Zebra Finch, Western Gerygone, Hooded Robin (ssp westralensis) and other common species. 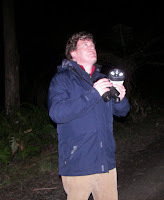 A Spotted Nightjar was also flushed near the campground entrance. A site which required 4x4 (or at least high clearance), N'Dhala proved to be an excellent spot for Painted Finch. The best spot to see them was at a rock pool about 3 quarters of the way down the designated walk. The pool has a large rock face on the south side, a sandy area on the north-west, and there are also several dead branches over-hanging the water. Painted Finch, along with large numbers of Zebra Finch and Diamond Dove repeatedly drink at this waterhole during the heat of the day. This site is a very good area of Spinifex covered limestone-ridge habitat near Alice Springs. 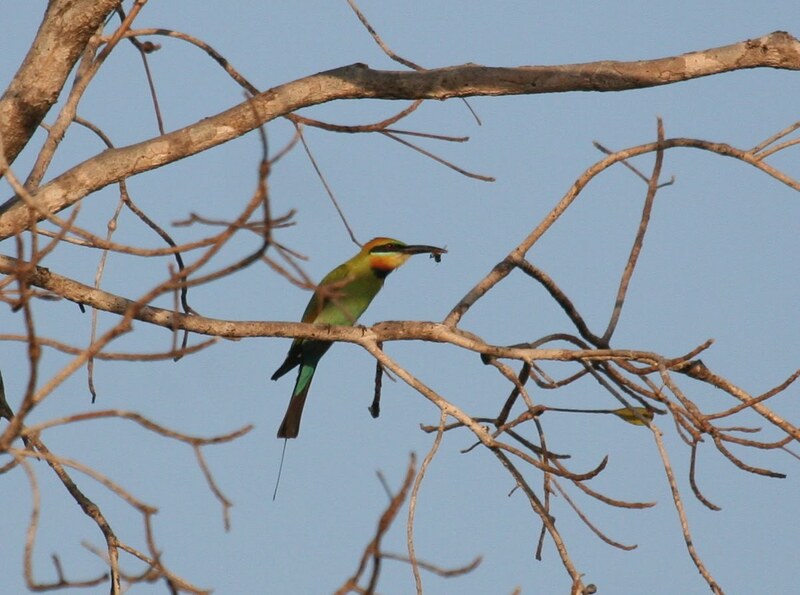 The best area for birding is located on the Santa Teresa 31.5 km from the airport roundabout. Here Spinifex meets the road on both sides and to further assist there is a car tyre wedged in a powerpole at this point. Santa Teresa Rd has recently become popular among birdwatchers as an accessible location near Alice Springs where one can see Rufous-crowned Emu-wren and Dusky Grasswren. Often the most reliable area is amongst the larger clumps of Spinifex on the rocky slopes and valleys on the east side of the road, I've seen them on both sides. As a rule Rufous-crowned Emu-wren seem to prefer the small valley areas – listen for their high pitch insect-like call – while the Dusky Grasswren tends to prefer the rocky escarpment and scree country. Dusky Grasswren have a trilling call that is noticeably more strident than the Rufous-crowned Emu-wren. The grasswren seldom flies, preferring to bounce over boulders with their tails cocked. When disturbed they will dash away, with their tails lowered to seek cover within or behind a well-placed Spinifex clump. We also saw Spinifexbird, also occurs at this site. While searching for the Grass- and Emu-wren we also encountered Singing and Grey-fronted Honeyeater, Chiming Wedgebill, Crested Bellbird, White-browed Babbler, Crimson Chat, Black-faced Woodswallow and Painted and Zebra Finch. On the road between the airport and the above site we saw Spotted and Marsh Harrier, Australian Ringneck, Cockatiel, Budgerigar, Black-faced Woodswallow, Rufous Songlark, Diamond Dove and Zebra Finch. If you do not find Dusky Grasswren at the above site, another area worth a visit is the cliff-top edges of the flat-topped hills 26.5 km from the airport roundabout; an area that is also good for Grey-fronted Honeyeater. This proved a reliable site for Red-browed Pardalote. Excellent views twice - in the carpark and on the river bank down near the toilet block. Diamond Dove and Brown Honeyeater were fairly common here and the only site that Cockatiel was recorded. Unfortunately no Grey Honeyeater, which have been known to nest here when the mulga is in flower. Excellent views of the resident male Western Bowerbird tending to its bower. Several Red-browed Pardalote also seen. Budgerigar, after good rains large numbers of birds where seen right across the Red Centre. We searched many areas from the bore itself down the turnoff road for about 5km for Grey Honeyeater without any luck. We did however get excellent views of several Slaty-backed Thornbill. Chestnut-rumped, Yellow-rumped and Inland Thornbill (ssp whitlocki) were all fairly common here, together with White-backed Swallow, Western Gerygone, Grey Fantail (ssp albicauda), Southern Whiteface, Red-capped Robin, Hooded Robin, Crested Bellbird (ssp pallescens) and White-browed Babbler (ssp centralis). We later staked out the dam at Kunoth Bore, and just after sunset had 7 Bourke's Parrot land within 10m of us at the water's edge. This was on a small rise on the south-western corner of the dam. On one afternoon we spent many hours checking endless numbers of Southern Whiteface, hoping for Banded Whiteface, without luck. The next morning we finally located a few Banded Whiteface a couple of kms south of the '2 trees' area, west side of the highway. 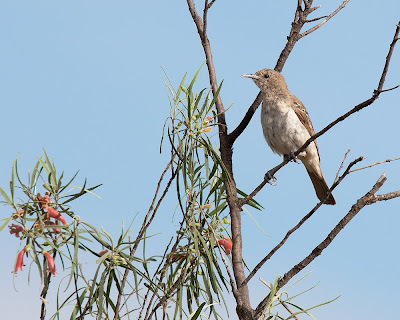 Female Pied Honeyeater, 20 km nth of Erldunda. Chiming Wedgebill was surprisingly common, with birds calling constantly throughout the area. Other birds of note were Crimson Chat (many), a couple of Orange Chat, Crested Bellbird, a few Pied Honeyeater which were frequenting flowering Eremophila, White-fronted Honeyeater, White-backed Swallow, Western Gerygone and 3 species of fairy-wren (White-winged, Splendid (ssp musgravi) and Variegated (ssp assimillis). While driving back to Alice an unfortunate Red-backed Kingfisher flew straight into the side of our car. With some misfortune I said "I'm afraid to say that that was a trip tick". We ended the trip with a trip to the Alice Springs Sewage Pinds, where there was a nice mix of waterbirds and waders including Australian Pratincole, Gull-billed Tern, Common Sandpiper and Wood Sandpiper.